Feeling a bit Peckish? Try our Daily Specials! Posted by Marsha Goodale on 2012/01/25 in Articles, Daily Specials, Lunch, Menu, Slideshow | Comments Off on Feeling a bit Peckish? Try our Daily Specials! Home » Articles » Feeling a bit Peckish? Try our Daily Specials! Stop by on Saturday and Sunday mornings and try our new Windsor Breakfast menu! Breakfast is served from 9:00 am until 11:00 am on Saturday and Sunday. Our traditional daily lunch menu with specials is available at 11:15 am! We have extended our hours daily until 5:00 pm for those that want that extra dessert! Our traditional Sunday slow cooked and tender Pot Roast special with homemade gravy, potato, yorkshire puddings and a vegetable is a favorite and begins at 11:15 am. 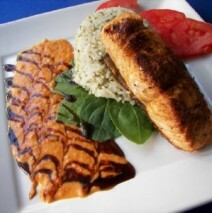 Throughout the weekdays we have our Scottish Salmon Filet served in many different ways and a fresh Soup Special daily. Come in and try any of various Daily lunch specials!